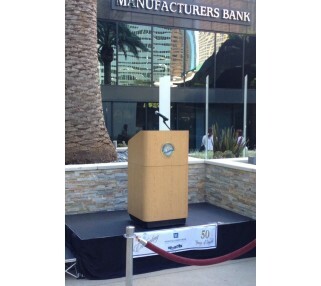 This podium rental sports a beautiful and elegant wood veneer, perfect for any setting. The Concord Lectern from Da-Lite features an over-sized reading surface, and other must have features for a professional setting. The Concord can also convert from a full size floor lectern to a tabletop model. Complete your presentation with a sleek Shure gooseneck microphone.